With more than three months left until Election Day, the 2012 general election campaign is well under way. President Obama and his presumptive Republican challenger, Mitt Romney, have been actively campaigning in states that are expected to be battlegrounds in November. And Obama and Romney, along with their political allies, have also been busy raising millions of dollars that will be spent airing television ads in those same states. By the time Election Day arrives, the amount spent on TV ads by the candidates, political parties and allied groups is expected to easily break the record set in 2008. All of the campaign visits and all of the money being spent on television ads raise an important question for scholars and interested observers of presidential elections: How much difference does all of this campaigning and spending make? According to some recent polls, more than 90% of voters have already made up their minds about the presidential contest, so there aren’t many undecided voters left to persuade. And political science research has shown that even well-organized voter mobilization campaigns have only a small impact on turnout. An awful lot of money and effort are being expended to influence a sliver of the electorate. In order to answer the question of whether presidential campaigns matter, I analyzed evidence from the 2008 election. In 2008, just as in 2012, the presidential campaigns focused their efforts overwhelmingly on voters in a relatively small number of swing states. According to spending data compiled by CNN, 15 states accounted for almost 90% of total spending on television advertising by the Obama and McCain campaigns. These same 15 states were also heavily targeted for grassroots voter registration and get-out-the-vote drives by the campaigns. 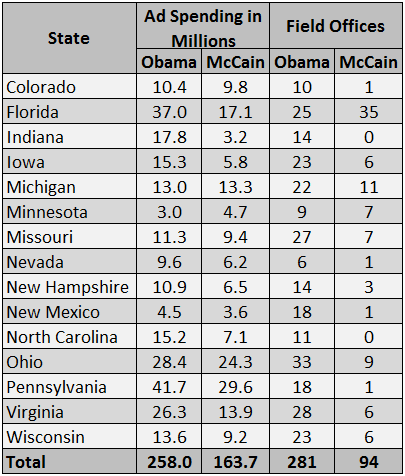 According to data compiled by Nate Silver of FiveThirtyEight.com, as of early August, more than 80% of Obama field offices and more than 90% of McCain field offices were located in these states. Thanks to Barack Obama’s enormous fundraising prowess, which allowed his campaign to turn down public financing, the Obama campaign enjoyed a substantial advantage in spending on TV advertising in the battleground states. Altogether, the Obama campaign and its allies spent about $258 million on television ads in these 15 states, compared with about $164 million by the McCain campaign and its allies, a better than three-to-two advantage. Perhaps reflecting its greater emphasis on grassroots campaigning and ability to capitalize on the enthusiasm of its supporters, the Obama campaign had an even bigger advantage when it came to field organization in the battleground states. As of early August, according to Nate Silver, the Obama campaign had opened 281 field offices in these 15 states, compared with only 94 for the McCain campaign, almost a three-to-one advantage. There is no question that the Obama campaign enjoyed substantial advantages in both advertising dollars and field organization in the battleground states. However, the size of these advantages varied considerably from state to state, as the data displayed in Table 1 show. In Indiana, for example, the Obama campaign outspent the McCain campaign by a more than five-to-one ratio. And by early August, the Obama campaign had opened 14 field offices in Indiana, compared to none by the McCain campaign. In contrast, in Minnesota, the Obama campaign had only a small advantage in field offices and was actually outspent on TV advertising. Sources: Advertising spending data compiled by CNN; field office data compiled by Nate Silver. The Obama campaign may have chosen not to spend much money on TV ads or to open many field offices in Minnesota because it knew it didn’t have to. Based on its past voting history, Minnesota was probably considered safe for Obama. It had voted for every Democratic presidential candidate since 1976, and John Kerry carried the state by more than three points in 2004. In contrast, the McCain campaign may not have realized until it was too late that it was in danger of losing Indiana, a state that had voted for President Bush by a margin of more than 20 points in 2004. In order to measure the effects of both advertising spending and field organization on the results of the 2008 election in the battleground states, we need to control for the underlying partisan predispositions of these states. I did this by using the results of the 2004 presidential election to predict the 2008 results. The Kerry vote in 2004 was a fairly accurate predictor of the Obama vote in 2008 — the correlation between the two was .92. I then used the difference between Obama’s actual vote and his predicted vote to measure Obama’s performance differential in each state. A positive number means that Obama did better than expected while a negative number means that Obama did worse than expected. For example, Obama did about 13 points better than expected in Hawaii and about 10 points worse than expected in Arkansas. Source: Data compiled by author; Obama vote percentage based on two-party vote. 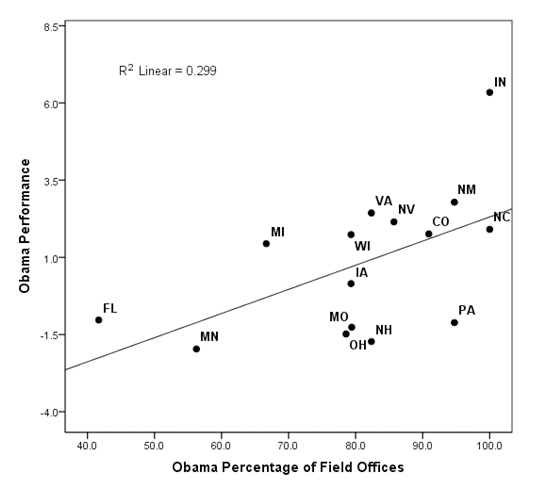 The question that interests us is whether either advertising spending or field organization had any impact on Obama’s performance differential in the battleground states in 2008. Table 2 displays the performance differential measure for the 15 battleground states. Obama did better than expected in nine battleground states, but he did worse than expected in six. 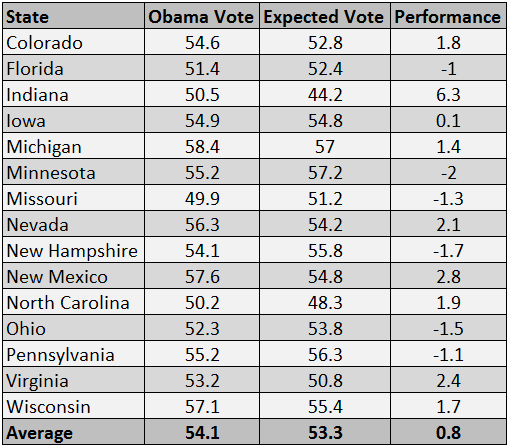 On average, Obama received 0.8% more of the vote than expected in these 15 states. This indicates that despite the major advantages that the Obama campaign enjoyed in terms of advertising spending and field organization, his performance in the battleground states was only slightly better than what would have been expected based on the results of the 2004 presidential election. However, the performance differential varied considerably across these 15 states. Obama did more than six points better than expected in Indiana, which was by far his strongest performance in a swing state. On the other hand, he did about two points worse than expected in both Minnesota and New Hampshire, even though he carried both states rather easily. Figures 1 and 2 display the relationships between the Obama campaign’s percentage of total advertising spending and its percentage of the total number of field offices in each of the 15 battleground states and our measure of Obama’s performance — the difference between the actual and expected Obama vote. These results indicate that there was a moderately strong relationship between Obama’s performance differential and both campaign variables. The greater the Obama campaign’s percentage of total advertising spending and the greater its percentage of field offices in a state, the stronger its performance compared to what would have been expected based on the results of the 2004 presidential election. In order to estimate the contributions of advertising spending and field offices to campaign performance in 2008, I performed a regression analysis with the performance differential as the dependent variable and advertising spending and field offices as the independent variables. Despite the fact that the results were based on only 15 states, the estimated coefficient for the field office variable was significant at the .05 level and the coefficient for the advertising variable just missed being significant at the .05 level. 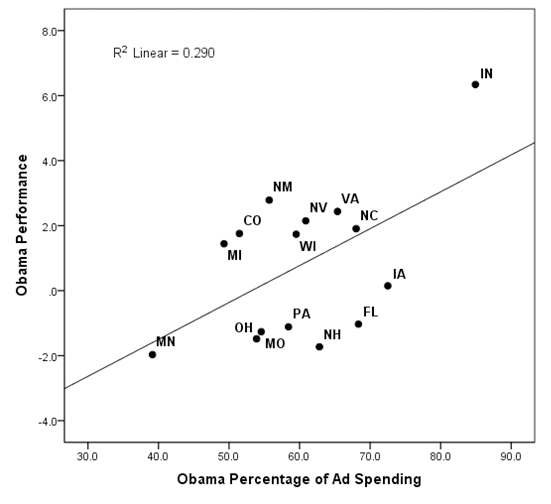 According to the results of the regression analysis, every 1% increase in Obama’s share of advertising spending in a state increased his share of the vote by about .08 percentage points, and every 1% increase in Obama’s share of field offices in a state increased his share of the vote by .06 percentage points. Based on these results, it is likely that both advertising spending and field organization affected the election results in these 15 swing states. And the size of these effects appears to be large enough to have tipped two states that would otherwise have voted for John McCain into the Obama column: Indiana and North Carolina. We can estimate that the combined effects of Obama’s advantages in advertising spending and field organization increased his share of the vote by almost six points in Indiana and by almost five points in North Carolina. And a massive 27-7 advantage in field offices almost put Obama over the top in Missouri: adding almost two points to Obama’s share of the vote and left him just short of victory. Evidence from the 2008 presidential election suggests that both spending on television ads and field organization affected the results of the election in the 15 battleground states. On average, the Obama campaign gained a measurable electoral benefit in these states from its huge advantages in spending and field organization. That electoral benefit may well have tipped two states, Indiana and North Carolina, to Obama. While the findings presented here suggest that advertising spending and field organization made a difference in the battleground states, they did not alter the outcome of the presidential election. Twelve of the 14 swing states that voted for Obama probably would have ended up in his column even without any advantages in advertising spending or field offices because of their normal partisan voting tendencies and the national trend toward Obama. It is far from certain whether we can expect the same sorts of campaign effects in 2012. It is probably unusual for one candidate to enjoy substantial advantages in both advertising spending and field organization in a presidential election as Obama did in 2008. Neither the Obama campaign nor the Romney campaign is likely to enjoy a decisive advantage in ad spending this year. And an election with an incumbent running for a second term may be different from one without an incumbent. Nevertheless, the findings presented here suggest that under some conditions, presidential campaigns can affect election outcomes in swing states. These results also suggest that the impact of field organization can be just as great as that of spending on TV ads. The Obama campaign enjoyed an even larger advantage in field organization than in advertising dollars in 2008, and the findings presented here indicate that this advantage played a major role in Obama’s victories in Indiana and North Carolina and almost turned Missouri blue for the first time since 1996. Given the relative costs of field offices and TV ads, investing in field organization in the battleground states may be a more efficient use of campaign resources than spending on television advertising.